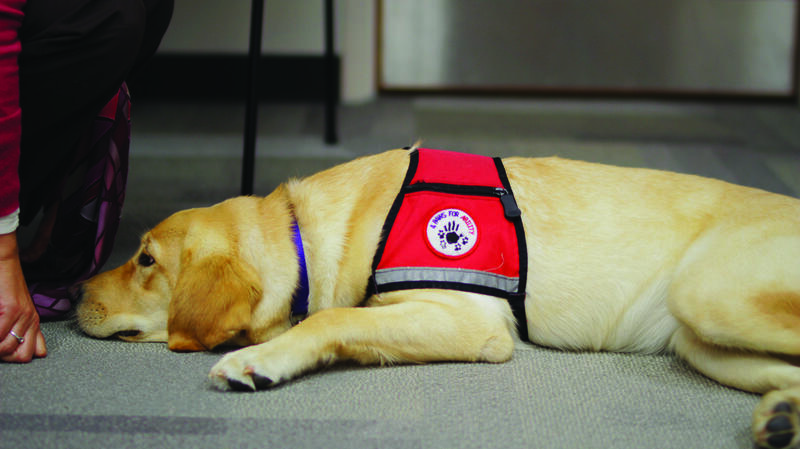 Students visiting the Cedarville University Writing Center for the first time this semester may be surprised at the greeting of one of its newest members: Katniss, a 6-month-old service dog in training. 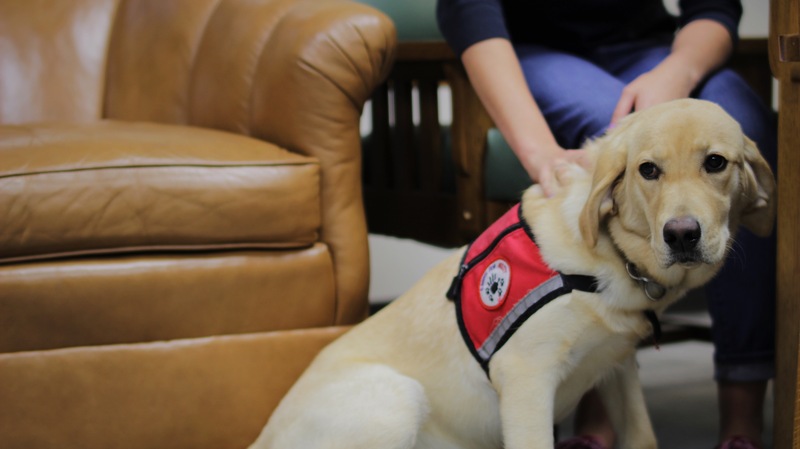 Professor Julie Moore, director of the Writing Center, has volunteered to foster Katniss as part of the 4 Paws for Ability organization. But the puppy is not the only addition to the Writing Center. Newly renovated this summer, the Writing Center, located in room 104 of the Tyler Digital Communications Center, is celebrating 15 years of helping the Cedarville University community in a variety of ways. 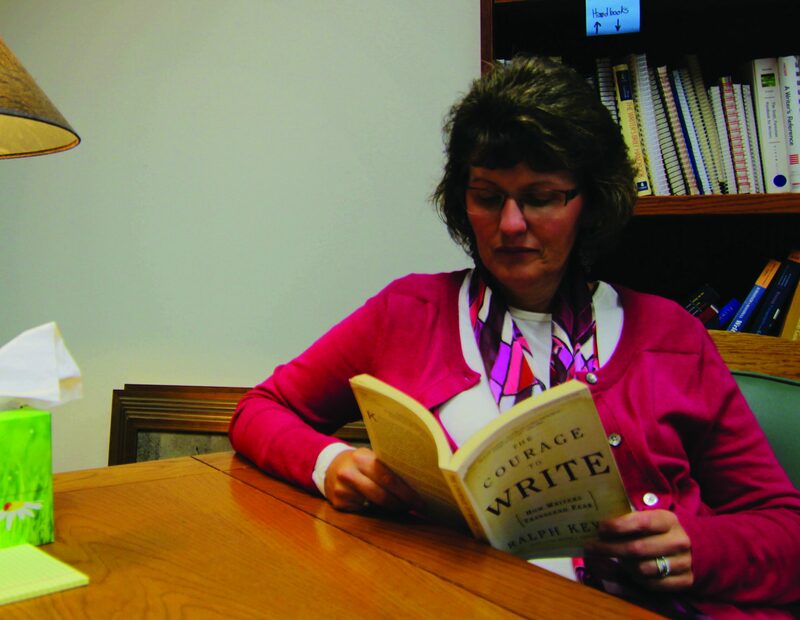 The Writing Center opened in the fall of 2002 as a one-on-one tutoring program for writers. Moore has been its director almost since the beginning. “The original mission and goals [of the Writing Center] are the same today: to help students learn how to write and to think better,” Moore said. Those skills are what employers look for in new employees, Moore said. In its decade and a half of mentoring young wordsmiths, the Writing Center has grown to include several new programs, workshops and resources. All of them are designed to help students become the best writers they can. Yet, the Writing Center’s original program, one-on-one tutoring, is still its primary focus. 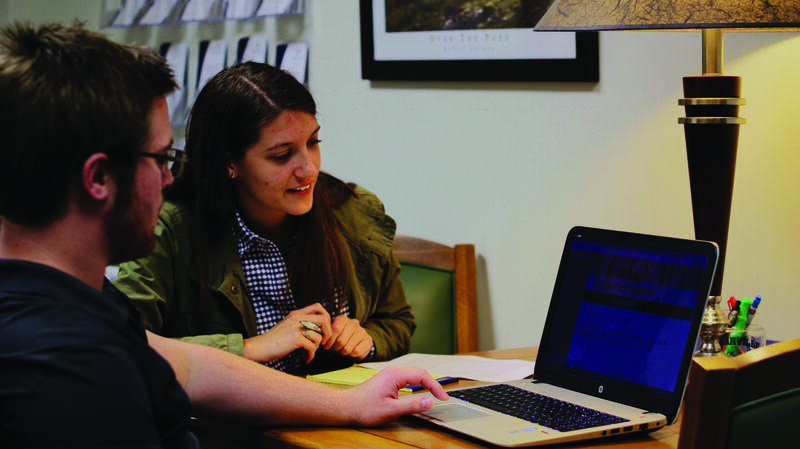 The program mentors Cedarville students in over 2,500 tutoring sessions a year. According to Moore, about 50-60 percent of students who come in for help with their writing are in a composition class. The other 40-50 percent come from every major, including graduate courses. The Writing Center, however, isn’t just for academic writing. The tutors are perhaps the most important part of the Writing Center. They are the ones who sit down with students and help them improve their writing. The position of Writing Center tutor requires the completion of a university-level class, Moore explained. No other student job on campus requires a class before employment. Moore said this ensures that the students working in the writing center are committed. These student tutors come from a variety of majors, including English, pharmacy and liberal arts. The variety of tutors is important because students coming to the writing center have a variety of different majors. Janessa Krueger, a Writing Center tutor and pharmacy major, said she enjoys meeting lots of people and learning about different majors through their writing. Despite the variety of major backgrounds, the tutors agree that collaborating on papers is important. “[There’s value in] just sitting with a couple of friends and bouncing ideas off each other,” Emma McCarthy, a Writing Center tutor and nursing major said. “They will see things that you won’t,” Grandouiller added. This talking and collaboration does not include marking on papers with red ink. The Writing Center tutors won’t tell students what to write. Rather, the Writing Center exists to help writers learn how to edit their own writing, not to edit their writing for them. “We want writers to own their writing,” Grandouiller said. The Writing Center has a noticeable impact on not just students but the tutors and faculty as well. Tutoring at the Writing Center isn’t just a job; it’s a learning opportunity. Emily Genet, a Writing Center tutor and pharmacy major, said she enjoys reading students’ research papers because she gets to learn things she otherwise wouldn’t. Christiana Manthei, a Writing Center tutor and liberal arts major, said she enjoys the intellectual discussion she finds within the Writing Center community. Even the professors who work at the Writing Center benefit from reading students’ papers. “We feel like we learn a lot,” Moore said. Besides the one-on-one tutoring, the Cedarville University Writing Center also offers a podcast hosted by Writing Center Assistant Director Isaac Mayeux. Almost every class has some sort of writing component to it, and every professor has a different perspective on just what writing is and should be. The Fill in the Blank podcast seeks to understand those professors’ views so students can know how to tailor their writing. “This is a show about gaps: Gaps between students and professors, gaps between writers and readers and even gaps between writers and their own writing,” Mayeux says in one of the podcasts. The purpose of the show is to either bridge those gaps or simply understand and accept them. In the podcast, Mayeux interviews professors and other visiting writers. One of his goals is to show professors on a more relatable level. “[Professors] are more than the academic selves they present in class,” he said. Moore had the idea for the podcast years ago, but never had time to work on it. So when Mayeux was appointed as the assistant director, Moore approached him with the idea. The podcast has featured faculty from a variety of departments. Mayeux has interviewed Dan Sterkenburg, an associate professor of business; Thomas White, president of Cedarville and most recently JR Gilhooly, assistant professor of philosophy and theology. The topics discussed range from writing assignments, to faith, to a donut’s soul. The Writing Center has come a long way since its start in 2002. The mentoring program, in which a tutor is assigned to a student for a specific class, is still relatively new to the Writing Center. Moore said she hopes to see it expand. The idea is students will learn better if they consistently work with the same tutor over an entire semester, instead of meeting with a different tutor each session. Mentoring, Moore said, is a tutoring relationship. The Writing Center is also now working with the Writing Across the Curriculum program, or WAC, coordinated by Melissa Faulkner who an associate professor of English and interim chair of the English, literature and modern languages department. Its goal is to designate classes in every major, or in the entire general education curriculum, as a writing intensive. This way every Cedarville student, regardless of major, is guaranteed to have a few writing intensive classes. As WAC designates classes as writing intensives, the Writing Center aims to support them by providing mentors in each class. “That will improve the quality of education here tenfold,” Moore said. Moore said she hopes that students won’t just take composition their freshmen year, only to forget what they have learned. Moore compared writing to playing sports. No one on campus is a perfect writer, Moore said. Even as the Writing Center grows and expands, its core mission stays the same: to help students communicate their thoughts well. Paolo Carrion is a freshman Journalism major and campus news writer for Cedars. He enjoys drinking hot chocolate, reading comic books, and making animal crackers watch as he devours their family. No Replies to "Writing Center Celebrates 15 Years"